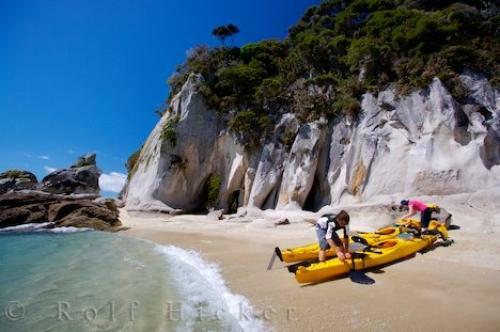 A guided kayaking tour along the Abel Tasman National Park coastline is a must do while on vacation in New Zealand. A simply magical vacation option during a trip to New Zealand is to spend a day or multiple days kayaking the Abel Tasman National Park on the South Island of New Zealand. The Abel Tasman National Park is situated at the top of the South Island, separating Golden Bay and Tasman Bay. At an area of 22,530 hectares or 225 sq km, the Abel Tasman is the smallest of New Zealand's 10 national parks. Photo of people on the beach at Arch Point during a kayaking tour in the Abel Tasman National Park. ... for visitors from around the globe. The best way to explore the Abel Tasman is by taking a guided kayaking tour. Your guide will not only cook you up a delicious meal, but they also impart interesting facts about the area and take you places where few have been before. Kayakers on the beach at Arch Point, Abel Tasman National Park, Tasman District, South Island, New Zealand. (Model Released). Check out our story on kayaking in Abel Tasman National Park in New Zealand. I photographed this photo with the digital SLR camera model Canon EOS-1Ds Mark II, aperture of f/5.6, exposure time of 1/200 sec. on ISO 100, as always I used a original Canon Lens, the focus lenght for this picture was 16mm.